We all have things we want to accomplish, right? Often times, those projects get pushed aside and forgotten about and then we wonder later why it never got done! It was driving me crazy that I knew there were things to do and I was never getting them done. So, I set out to tackle them with a project list. Today, I’m going to share how to start your own project list! There are 3 easy parts to your project list. I’m going to list them for easy reference and then explain them in detail for you. 1. Select how long you have to complete the list. 2. Select how many projects you are going to put on the list. 3. Start writing the list. 4. Use the list whenever you have free time. Select how long you have to complete the list. Setting a deadline for the list will help you accomplish the items on the list. I set my list for 150 days, which is approximately 5 months. I based it around my life and when I would like to see these projects accomplished. I chose 5 months because that is when summer vacation will start for me and I don’t want all of these projects still hanging over my head. Look at your own life and calendar and select a time frame that works for you (large or small). Select how many projects you are going to put on the list. It’s best if you select a number of projects that are allowed on the list. You don’t want to put too many or they might not get accomplished. I chose 50 projects for my list, but they aren’t all large projects. (I liked the way 50 in 150 sounded!) Some are activities and others are simple things like get a haircut. I mixed big and small projects onto the list to keep it balanced. Start writing the list. In order to actually complete a list, you need to start it. I started my list, but I haven’t finished it yet. I keep adding to the list as I find new projects that I need to work on. Remember, I mixed smaller things in as well. 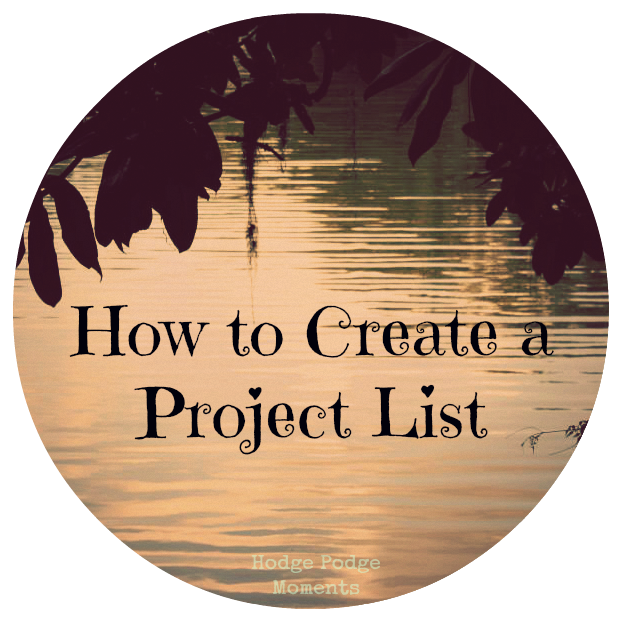 You could create a list of just big projects if that works best for you. Don’t worry about filling the list right now – simply start it. You can add new projects as they come up! Use the list whenever you have free time. When you have a moment and you’re wondering what you should do with it, pull out your list. I have mine on my computer so that I can get to it easily. This way it also doesn’t get lost. When I’ve finally got 50 projects on it, my plan is to print it out and hang it where I’ll see it. There you go, four easy steps for setting up a project list and tackling it. I’ll let you know how mine is going once we get closer to summer! What’s a project that needs to be tackled in your life? Tell me in the comments!